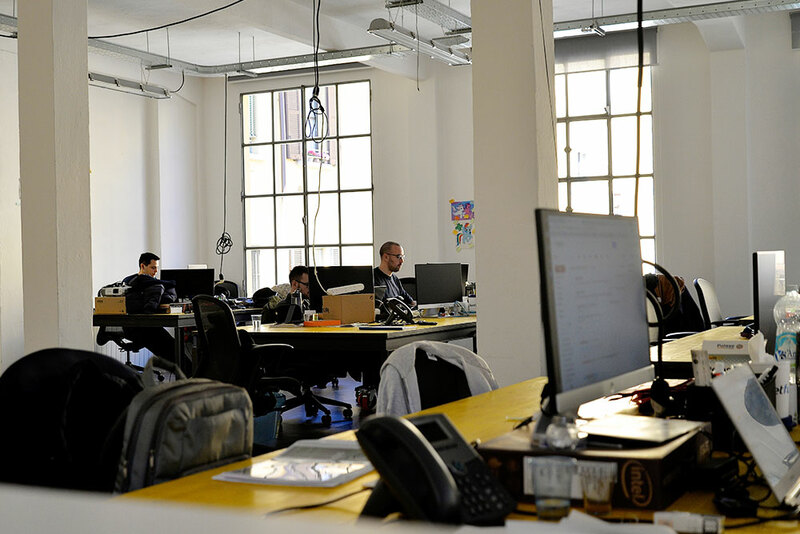 His office is a loft in the Isola neighbourhood of Milan. It used to be a rolling shutter factory that now is the Italian headquarters of a reality that is revolutionizing the global advertising world, RocketFuel. At the entrance we find a Ducati Monster 620 dark, which Quaroni will later admit it is something from which he would never want to part: “I hardly ever use it, but just the idea of having it makes me feel very free. It’s a very romantic means of transportation, like a horse. I’m not a great fan of motorcycles, but the idea of a motorcycle is wonderful. 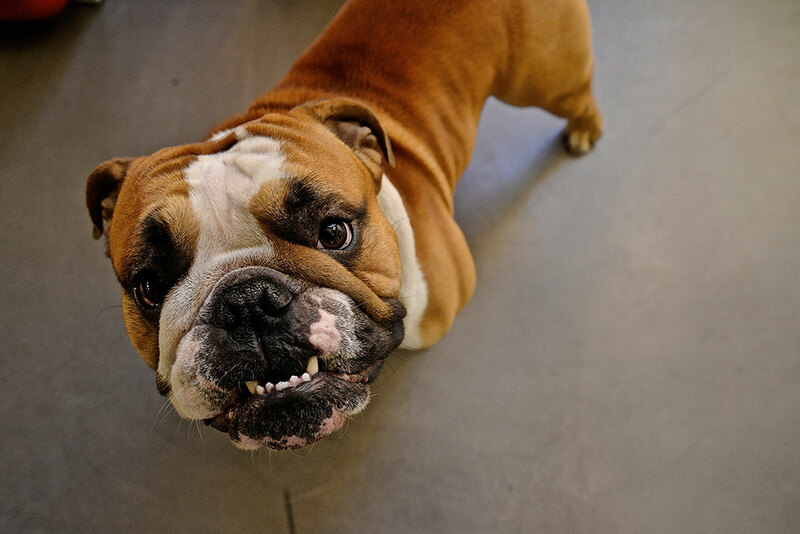 I’ll never get rid of it.” Ercole, his two-year old English bulldog greets us at the door of the open-space that houses the offices. 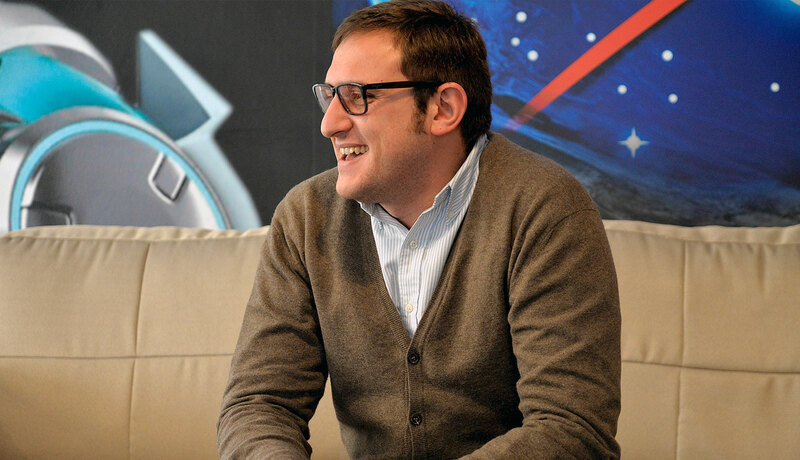 He’s an outburst of sweetness and happiness, another element that Enrico Quaroni, 33, Country Manager of RocketFuel would never give up. “I can be very effective without losing my cool. I’m never negative and I try to be very upbeat: this is a fundamental to having a well-working team and to be successful”. According to Enrico, team-work is really important, just like the care for his workers. You can tell because when I ask who his role models are, he cites two businessmen who have proved that it is possible to achieve excellent results also working out of the box: Richard Branson and Brunello Cucinelli. “I love Richard Branson’s style; it represents a way of doing business that I share, I like the desire to change the rules but at the same time to maintain a human organizational level, even if it is very rational. I never had the luck of meeting him personally but I follow his blog posts. At an international level, he is certainly a leader. In Italy I really like Cucinelli: he’s an example of sustainable business in one of the most beautiful medieval villages that exist. He proved that one can create and maintain a very successful company with world renowned qualitative standards betting on Italian characteristics: the quality of craftsmanship, the ability to keep a unique and unrepeatable style; something that all Italians find in themselves and that he managed to shape in particular by making the work force loyal and allowing everyone to benefit at all levels from the success of the company. Elegance, intelligence and creativity are innate in our country. Cucinelli managed to bring them out and create something that is magical. It inspires me that also in Italy, where from different points of view there is an extremely complex ecosystem it is possible to realize grand projects”. He says the same thing at the end of our chat, when asked what it means to enter into a booming company: “It means staying calm and not having delusions of grandeur. One good thing about being from Milan is the ability to keep a low profile. People from Milan manage to do extraordinary things without exaggerating in showing off their success. It seems like something trivial, but it’s very useful for business; for one’s reputation; for the health of a company to manage to celebrate all together the results achieved as a team, but without excesses; something that is done very well in Milan. Joining a booming company is cool, but also very dangerous. Staying humble and down to earth is the best thing”. “One has to know how to handle success”. At this point I’m really interested in his work lifestyle. Enrico admits that his days tend to be hectic, but also very well organized: “I learnt to manage time adequately, in particular now that many activities take place on different time zones”. His secret to improve performance is to keep the right level of stress and never be overwhelmed by anxiety, too many appointments or excessive pressure. “The most important thing is knowing how to position the different aspects of life in the right place. Work is certainly an important driver, without ever forgetting that one has to take things with a light touch and not be overwhelmed by problems, failures or unforeseen difficulties”. The best word to describe him is “multifaceted”: “I always had a certain resilience and flexibility in my work experience, knowing how to adapt and deal with unexpected events that I had to face. Life taught me to be quick in changing direction and resilient when necessary”. It’s time to learn something more, outside the workplace, about Enrico Quaroni. I ask him therefore what his favourite city is and he tells me that for now he’s in love with San Diego, for its climate and the easy going life style: “there are those places that take your breath away for their beauty and for how pleasant they are. The climate in San Diego and the Pacific Ocean make it magical”. “I often go out to lunch and dinner for work and I therefore have to be very careful with my diet; I have to eat, and drink, well. I don’t drink cocktails, I prefer wine, and I’m careful with the quality of what I eat”. Speaking of the reference sector of RocketFuel, the company where he works, I ask Enrico to briefly tell me how the advertising industry has changed with the advent of new technologies: “Data driven marketing is the Copernican revolution in the advertising world. Once you would buy media with precise rules and preconceived notions. The idea was that your audience was static and you had your regular publishers. In data driven advertising, it’s people marketing, oriented towards persons. It’s a different perspective from which also publishers benefit using innovative technologies. The idea is to make the user see only what is relevant; not to depend on social-demographic data but on coherence of the effective wishes, which can be calculated through an algorithm”. “The more you become convinced that the client is at the centre of your thought, the easier it will be to interact, to involve, to capture a new client”, Enrico says. There are different realities that are doing well. The best, I think, is RedBull that created a new culture, of extreme sports and therefore of consumers who can use the product in a specific context; also Starbucks that proposed a different way of living both in one’s free time and at work. In Italy, a company that interprets this vision is Panini Editore. With a series of events it gave life to something ingenious where fans meet throughout Italy to exchange trading cards. Panini was able to make the user feel at centre stage without gaining anything from it”. I have one last question: what innovation will change the world in the next 15 years? “Electric cars will bring great benefit both economically and environmentally as well as in terms of geopolitical equilibrium. They will reduce tension in those parts of the world where oil is a primary resource”. “I think the greatest technological innovation will be to create cities and spaces that are increasingly planned to welcome electric vehicles”.